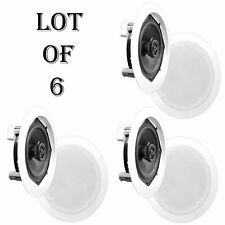 Polk Audio OS70 6 1/2 inch Outdoor Loudspeakers White NIB Speakers Pair 6.5"
With 2pcs powerful full-range 5W speaker unit, this 2.0-channel audio takes your movies, TV Shows and music beyond traditional stereo sound. The 20" soundbar easily fits with any20" Class TV. BLUETOOTH 5.0 TECHNOLOGY: With Bluetooth 5.0, the soundbar can pair with your device in seconds, Bluetooth module adopts RF technology. 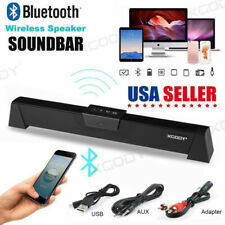 Wired and Wireless Connections: Besides wired connection through USB / RCA / AUX / 3.5mm interface, the soundbar speaker also supports wireless connection with Bluetooth enabled devices. (Bluetooth with wireless working range of 33 feet) Streams your audio in multiple ways with powerful sound quality. FREE SHIPPING! Buy Refurbished DIRECT from POLK AUDIO!! Up for sale is a Bose Model 21 Speaker System Stereo Bookshelf Speakers Black (Pair). Condition is Used. Work great. Sale includes speakers only. What you see is what you get. FREE SHIPPING! Buy Re-Certified DIRECT from Def-Tech! Each speaker's cabinet houses a wide dispersion 1" Piezo tweeter for the clean, detailed highs and a 5-1/4" polypropylene woofer to handle the midrange and bass. The digitally tuned sealed enclosure fights internal vibrations that can compromise performance and a black ash wood veneer finish gives this speaker a warm, refined look, making it an attractive addition to just about any room. 38 "Sound Bar: This compact soundbar can be discreetly installed in bedrooms and living rooms. Set Put it on furniture or mount it on a wall: whether you put it on the furniture under the screen or mount it on the wall, the soundbar will match the design of your TV and enhance its sound. Trending at $138.49eBay determines this price through a machine learned model of the product's sale prices within the last 90 days. FREE SHIPPING! Buy Refurbished DIRECT from POLK AUDIO! Brand Unbranded/Generic MPN Does Not Apply Form Factor Soundbar Configuration 4.0 System Connectivity Bluetooth/Wireless Audio Inputs Digital Coaxial RCA Subwoofer Type Passive RMS Power 40W Sound Quality High Fidelity (Hi-Fi) Surround Sound 4.0 Channel Color Black Shape Horn Speaker Design 2-way Country/Region of Manufacture China UPC Does not apply Bluetooth Yes SNR ≥73dB Frequency Response 80Hz~16KHz Speaker Size 2"*4 Bass Diaphragm Size 50*120mm*2 . Insignia- 2-Way Indoor/Outdoor Speakers (Pair) - Black. Condition is New with distressed box. Shipped with USPS Priority Mail. Compared to traditional desk-top Bluetooth speakers, the Pulse is a space saver because it is integrated into light bulb socket. It also does not require any power cords or speaker cables. All correspondence will be responded to during these hours as well. This compact soundbar is perfect for TV, computer, notebooks, with strong stereo and saving space. It supports bluetooth, TF Card and AUX to play music, , with built-in microphone, also support mobile phone call. Review: The IP-08 Wireless SoundBar with Bluetooth let you enhance your TV experience with crisp dynamic sound..
Also subject to change especially during peak periods. In all, due to the amount I travel and living internationally from 2016-2018, this Playbar probably doesn't have more than 100 hours of listening on it. Physically it is in like-new condition. One (1) Sonos Playbar. 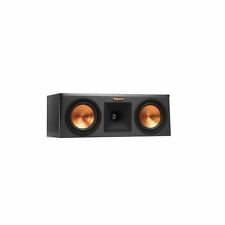 KEF Bookshelf Speaker Pair. T he speakers are in good condition. It is in working condition and both sound good. With a 3.5mm audio cable, u can connect the soundbar to your any devices with 3.5mm audio output port, and enjoy the lossless sound muisc and movies. With Bluetooth connect function, you can stream music and nice voice from any bluetooth devices such as smartphone, computers, tablet. Lose the wires and listen to your music with a tap of a finger from anywhere in the room. Tested and working. Lightly used. See pictures for exactly what is included. There is a small blemish on the front right corner. Yamaha -NS-AW190BL Natural Sound 5" 2-Way All-Weather Outdoor Speakers Black. Resolution is filed after step # 6. Nor do I have the information GSP has. We take pride in serving you! Check out our huge selection of diverse products. If you have any issue with the item. Samsung - Sound 2.0-Channel Hi-Res Soundbar with Wi-Fi Music Streaming - Black. Samsung Sound 2.0-Channel Hi-Res Soundbar with Wi-Fi Music Streaming. Network your sound sources with this Samsung sound bar. Samsung SWA-8500S/ZA Wireless Rear Speakers Kit. Open box new condition. Tested and fully functional. Shipped with USPS Priority Mail. Easy-mount Locking Swivel Bracket. High Performance Outdoor Loudspeaker Around a barbeque, by the pool, out on the deck. The OS70 outdoor loudspeaker creates a big, full sound for a great outdoor music experience. Local pick-up is FREE. This is for a. See pics for more details. SMP Liquidators does not own any products. We just liquidate assets! Local Pick-Up. POWER CORD. Samsung Swa-8500s/za Wireless Rear Speakers Kit - Kk185. Shipped with USPS Priority Mail. TOTEM ACOUSTIC Storm subwoofer in mahogany wood finish. Made in Canada.For sale is a Totem Acoustic Storm Subwoofer in Mahogany wood finish. The sub includes three drivers. One 8in active driver and Two 8in passive drivers. The JBL 2500 bookshelf speakers are renown for their amazing fidelity with a frequency response of 90 Hz to 23kHz; 88dB; 5 1/4" woofer; and a 1/2 tweeter. JBL you can't go wrong! Samsung Swa-8500s/za Wireless Rear Speakers Kit. Sound Appeal Outdoor Bluetooth Speaker System- White. Shipped with USPS First Class Package. No matter which seat you choose, this powerful speaker places you in the middle of all the action. Fills rooms with powerful surround sound effects. If your item has already left the warehouse, we cannot match any reduced pricing. Really nice expensive speakers that have the sound and look to match. Wall Mount Waterproof & Bluetooth Speakers, 6.5 Indoor/Outdoor SPECIAL OFFER! The Pyle PDWR61 mountable speaker systems provide high-powered wireless Bluetooth performance -- indoors or out! Featuring rugged marine grade waterproof construction, they are the perfect choice for adding full range stereo sound on boats, decks, patios or backyards. The system includes (2) speakers; one active and one passive, along with a built-in digital amplifier. Once connected, the polymer dome tweeters create crisp high frequency sound and the fortified long-throw woofers generate some impressive bass. Built-in Bluetooth audio streaming ability allows you to connect and stream audio from all of your favorite devices, quickly and easily (works with iPhones, Androids, Smartphones, Tablets, Laptops, Computers, etc.). Peavey PV115 800 Watt 15" 2-Way Speaker System Cabinet PV 115 Great Quality!